Although entertaining, I will just add that more than 20,000 species of bees have been described and named, including thousands of species that are actually native to the Americas, which honeybees are not. 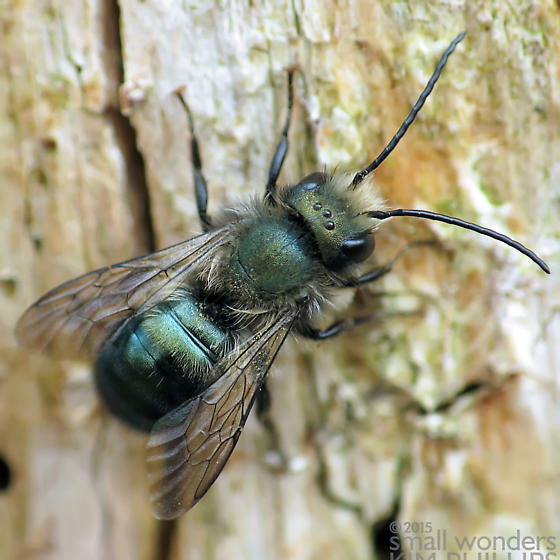 Honeybees have outcompeted and restricted the ranges of many native bees, just as imported starlings have outcompeted and restricted the ranges of native grackles. In my lifetime, grackles have become much less common than they used to be, which is a pity because not only are they native to North America, they are much, much prettier than starlings. The peculiar concern over the world starving for lack of honeybees is probably not quite the stupidest thing I’ve ever heard, but it’s right up there in the top ten. Especially since all cereal grains are grasses and all grasses are wind-pollinated. By an amazing coincidence, orchard bees are pretty often found in orchards — along with about a hundred other species of bees — where they do a good job pollinating fruit trees. Many native bees are better, more efficient pollinators than imported honeybees. Offhand I would expect that establishing populations of native bees where people want them would be much cheaper and more effective than building millions of robot bees. Of course, supporting populations of native bees might require reducing the population of honeybees … oh, wait, natural causes seem to be helping out with that. Next time you have the chance, you might go stand next to a flowering crabapple for a while and just watch to see what bees and other insects appear. Out here in the country where none of my neighbors are going out of their way to help honeybees crush native bees, I’ll easily see a dozen species of bees in a few minutes, plus syrphid flies. My favorite bees are the tiny metallic green ones. There are lots of even tinier black ones too. While Wal-mart may want to come up with new technologies to develop, robot bees may not be the very best choice. I’m going to have to start paying attention to the small flying things around? I had no idea there were that many bees, but I’m pretty sure I’ve seen the orchard bees, in my childhood, in the apricot orchard. And I can spot carpenter bees, as well as what I’ve been assuming are honeybees around the rosemary. An episode in “Black Mirror” involved robot bees that did the pollinating when real bees became extinct. Problem is, somebody hacked into the control system and weaponised the bees, so definitely no to robot bees! I suppose any programmable drone can be hacked, and probably would be eventually, but I’m having a little trouble imagining something the size of a bee carrying out significant attacks. Were they used as spies or did they carry teensy tiny bombs? swarms of drone could be problematic, even without venomous stings, maybe? Curare, or some of those Russian nerve poisons they use to execute ex-spies as recently happened in England, could be quite deadly if delivered in a tiny dosage by a small bee. If the bee goes unnoticed, tracing the killer would become that much harder for the police, who would concentrate on anyone who passed close by soon before the victim collapsed. Still far-fetched at the moment, but if lots of mechanical bees become a common useful tool, who knows? Okay, okay, I grant you, curare-laden robot bees would make excellent assassin’s tools. I take back the thought about teensy bombs. Robot bees could be pretty scary after all. In fact, never mind millions of robot bees — developing the technology solely as an assassination tool might make sense. Hopefully we’ll see that only in thrillers, not in real life. Rachel, think of being swarmed by thousands of robot bees, little tiny things that crawl all over you and get into every available orifice, tunneling through your internal pathways and into your organs. Simply gruesome. Stop, stop, this is not an image I need in my head! Fine, I concede, robot bees are the stuff of nightmares.